Currency markets are pretty moribund at the moment, aside from the euros slow move lower. The sterling/dollar pair is stuck in the $1.54 - $1.58 range and it would take something quite extreme for traders to be looking for this to change. 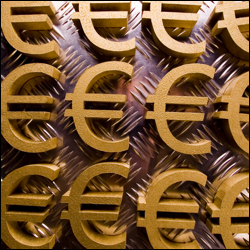 The euro seems to be virtually un-tradable from a security point of view as sudden announcements make for sudden moves. Many forex investors will be keeping their stops tight. Those expecting the Fed to adopt a more aggressive stance were caught on the wrong side yesterday and had to undo their previously dollar bearish positions. The Fed's largely neutral speech left many wondering whether the European Central Bank could do the same later today, making promises but taking no real action. Regardless, the EUR/USD forex spread trading market was hurt, declining 70 points to $1.2229, and could come under increasing pressure if the ECB do hold off as well. It was the potentially positive US ADP payroll number that seemed to be the sentiment yesterday which pushed the euro 45 points higher to $1.2298. Of course, it remains to be seen how long the euro's bounce will last. This is particularly true on the European front, if it turns out to be just another central bank meeting with a lot to argue for but not many agreements at the end. Yesterday the euro lost 83 points to the dollar to reach $1.2254. Last week's optimism has evaporated ahead of the ECB's policy meeting (due to take place this Thursday). Despite his rhetoric, investors are particularly worried about whether the ECB President will be able to gather enough support from EU officials. At the time of writing the euro is at $1.2275. Politicians and central bankers seem to be singing to the same tune. Comments from Germany over the weekend had a very similar tone to those from the ECB President Draghi earlier in the week. The markets are now expecting something from central banks this week, in particular from the Federal Reserve and ECB. Forex investors might be disappointed if nothing comes out of the FOMC meeting this week and we could see a pull back in risk appetite as a result. However there will be even greater disappointment if nothing materialises from September's meeting. Although, this time, it's not so much about the Fed than the ECB as the market is hoping that Draghi will back his words with action. Whilst the Fed has almost used up the bulk of its ammunition the ECB is still to really flex its muscle and so we wait with bated breath to see what they will come up with. For the euro bears all this rhetoric is nothing more than that, and rightly so, as the ECB has a specific mandate beyond which it can't do much more that stabilising prices and monetary policy. Draghi's predecessor was a serious stickler for the rules, so much so that he actually started raising interest rates during the height of the crisis. He would never have dreamt of taking the ECB down the path that it's taken until all the relevant treaties were in place. So will Draghi continue to bend the rules to his advantage and simply say that whatever he does is within the realms of stabilising monetary policy and therefore its mandate? And what form will the next round of QE from the ECB take? Will we see any bazookas? When you consider Darghi's comments you would have thought that he was gearing up for something more substantial than the recent SMP and LTROs which have well and truly worn off. To really bring Spanish and Italian borrowing costs down something a little more effective or substantial is required. Whatever happens it is likely to ruffle more feathers in Germany and make the central bankers there even more uncomfortable as they see the ECB, of which they are the biggest shareholder, expanding its balance sheet further and further. On Friday, the supporting comments from Angela Merkel and Francois Hollande lifted the euro to an intraday high of $1.2390. The single currency has been under pressure lately but last week's interventions from EU officials had the desired effect for once. Despite a retracement in the afternoon session the euro closed 43 points higher at $1.2321. This morning is seeing a bit of profit taking as it dips back below the $1.2300 mark to $1.2285. Needless to say, Mr Draghi's comments yesterday led to a spike for the euro. His statement was the biggest market mover yesterday pushing the euro 130 points higher to $1.2276. However, investors will want the words to be accompanied by actions. Yesterday an ECB official appeared to be in favour of awarding extended powers to the Eurozone's rescue fund. That was a breath of fresh air for the single currency and gave the euro a rare boost as it posted an 88 point gain versus the dollar to $1.2147. That interrupted the bleak five day losing streak. Giving the EFSF a banking licence is just one of the ideas being batted around. Of course, that's been the problem with European politicians of recent, lots of ideas but no action. This morning the euro is trading at $1.2150. The bears are seemingly in control but with sentiment so negative towards the euro there could be more room for a squeeze higher. It's not unreasonable to expect our economy to be suffering from the malaise of our biggest trading partners on the continent. Investors are losing confidence in Greece meeting its debt targets. They are also fearing bailout for Spain. In addition, Germany was warned it might lose its much coveted AAA rating and that has put extra downside pressure on the euro. As a result, it came as no surprise to see the euro losing another 54 points to $1.2061, a new multi-year low for the closing price. This morning at least, there's a little bit of a squeeze on the bears and we've already seen the single currency get itself back above $1.2100. Despite closing rather flat for the day at $1.2114, the common currency reached another low at $1.2065, last seen in June 2010. The driver behind it was undoubtedly an increase in the number of Spanish regional governments asking for a bailout. This saw yields on Spain's 10 year bonds rising to a new record of 7.59%. There don't seem to be many buyers out there willing to take the single currency and this morning EUR/USD is at $1.2105. After Valencia's regional government asked for financial help on Friday, the euro plunged 119 points versus the dollar, reaching multi-year lows before closing at $1.2154. At the same time, the yields on Spain's 10 year bonds rose to a record 7.24%. As if that was not enough to scare investors, the European Central Bank announced it will reject Greek bonds as collateral for the time being. All-in-all the single currency is very much out of favour and that negative sentiment is pushing the EUR/USD market lower to $1.2090 at the time of writing.